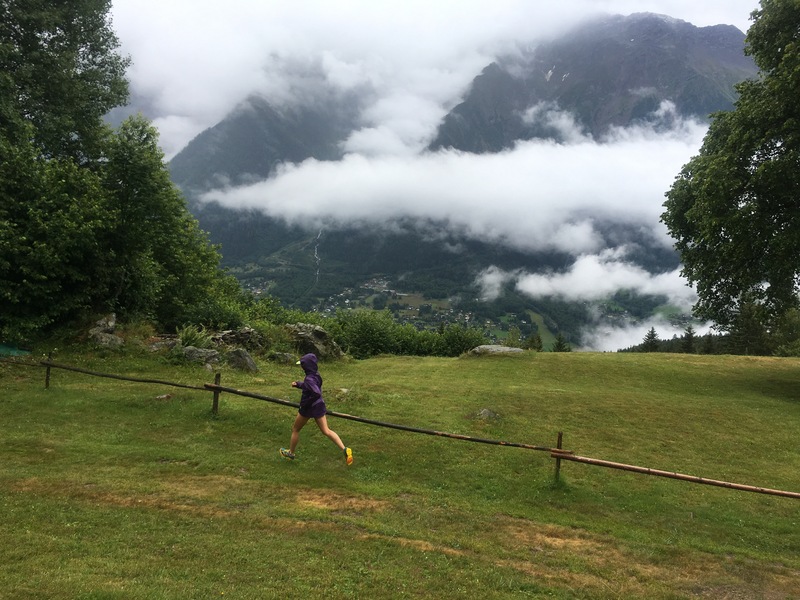 Chamonix Valley Trail running part 3 – in alpine rain storm! 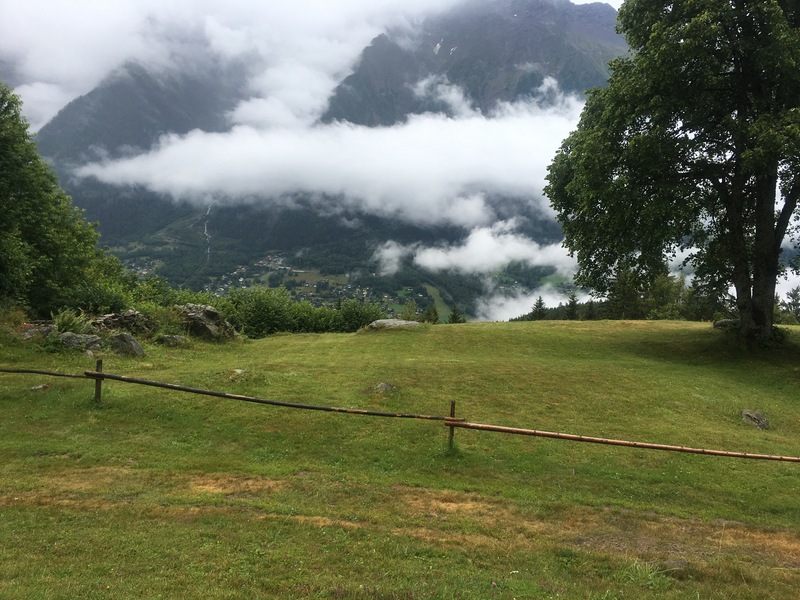 Our fifth day in Chamonix, and unfortunately our luck with the weather had run out. The rain outside was pouring down and the view of Mont Blanc from the Chalet was completely obscured in cloud. Fat chance of getting photos of some amazing views today then! Eventually we decided that we should go for a run anyway – it’s not like we’d never ran in the rain before! A trip to the Lake District almost guarantees a downpour. We decided to follow a route in our guidebook that kept to the valley floor. Armed with raincoats and peaked caps, we followed the road up to Les Chavants before joining the track. 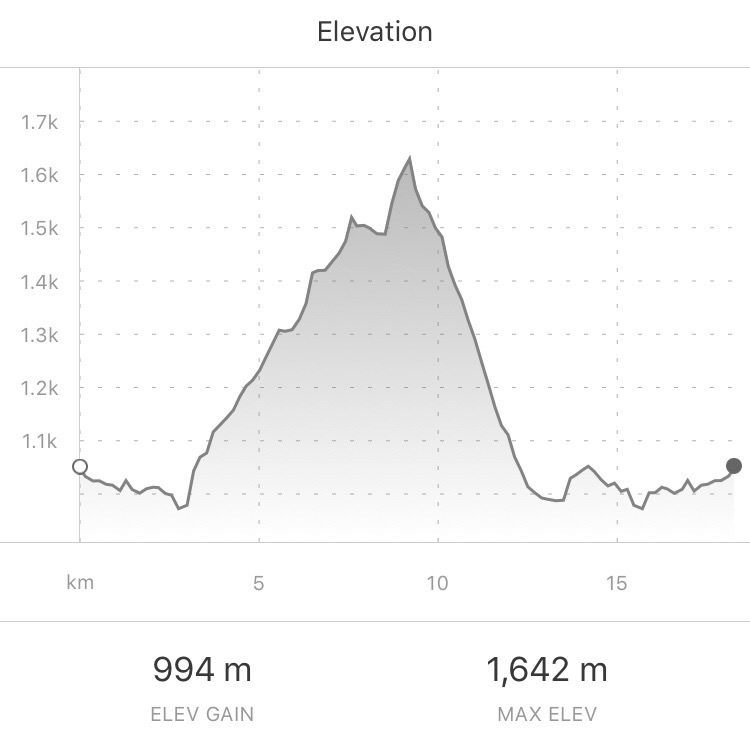 It was uphill, but runnable for the first km before becoming progressively steeper. At this point we had a choice – continue uphill or lose some of the elevation we’d already gained by circumventing the mountain to Charousse. 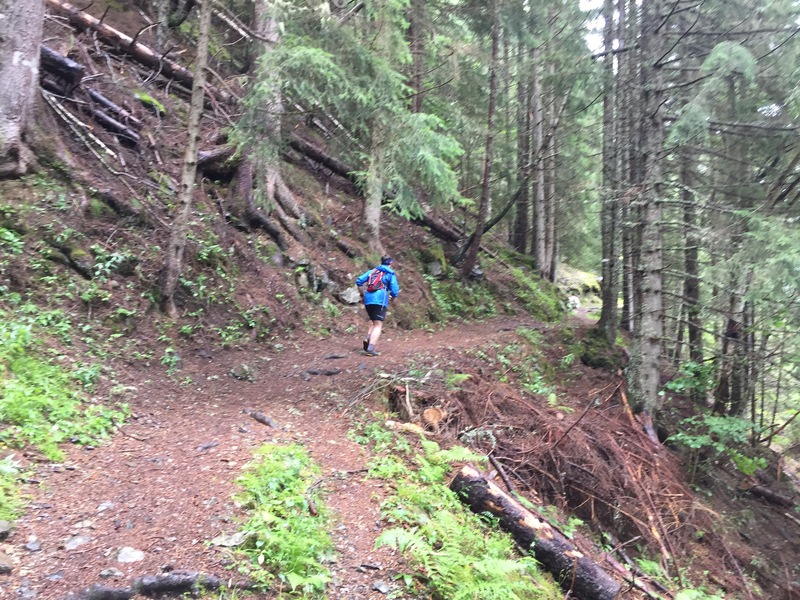 Perhaps foolishly, we headed further up – following signs to Forclaz, thinking that the elevation gain would be worth it for an easy run downhill into Servoz. It was a bit steep for enjoyable running and the rain was pouring down even harder. We had to check the map a couple of times to make sure we weren’t lost. We made it to Forclaz (1500m) and started the descent. It was again too steep to run and we picked our way down rocky and muddy trails that were almost streams due to the rainwater running down. To say we were soaked would be an understatement! We had imagined sheltered paths winding through woodland over babbling brooks with occasional light refreshing showers. This ideal never quite materialised. Since we were so wet, we decided to cut the route short and turn back before reaching our original destination – Servoz. We made it to Vaudague after an hour on the trails and decided that was probably enough rain for one day. We headed back to Les Houches via the circumventing path we’d avoided earlier, via Charousse, then home. This section was much nicer for running – wider paths and soft underfoot without the steepness. In summary, we got a bit lost but still put in a great effort and gained some good metres of elevation! We planned a run for our last day in Charmonix, knowing that it would be our last outing in this beautiful area. Our flight was due to leave at 9.45pm which meant catching the bus at 6pm. 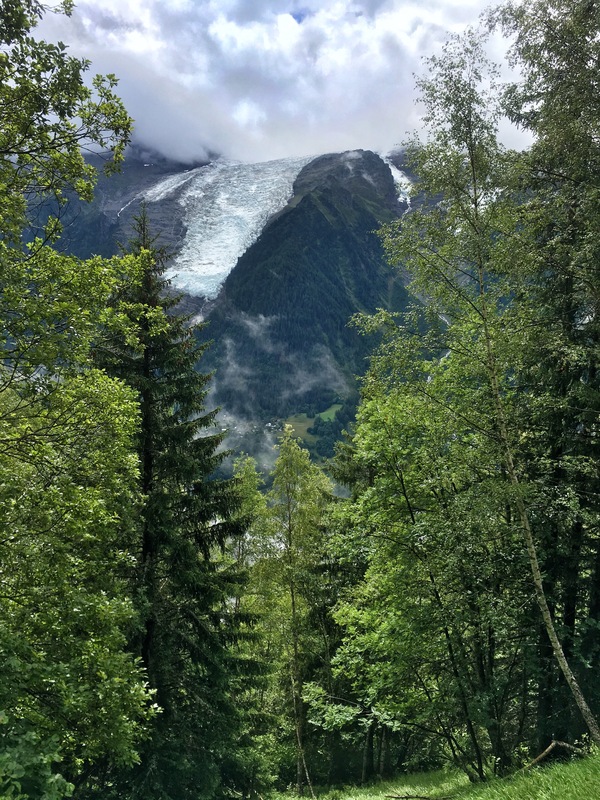 We wanted to finish our stay with a long run, with plenty of elevation, to make the most of our final hours in Chamonix. 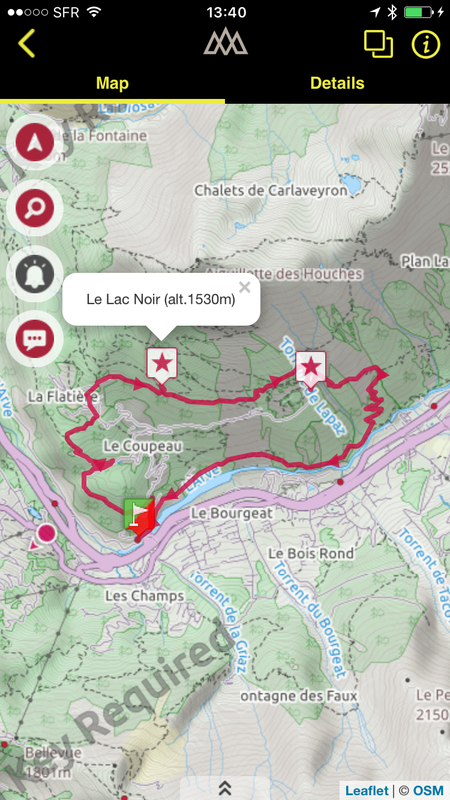 We downloaded a free trail app called ‘Vallee du Trail’, that had a perfect route pre-planned. This app is really great because it uses GPS to show your location relative to the trail. You can see the map of the route below. It was raining again, and the clouds obscured the view of Mont Blanc. It wasn’t as heavy as yesterday, nevertheless we started the run with raincoats on. 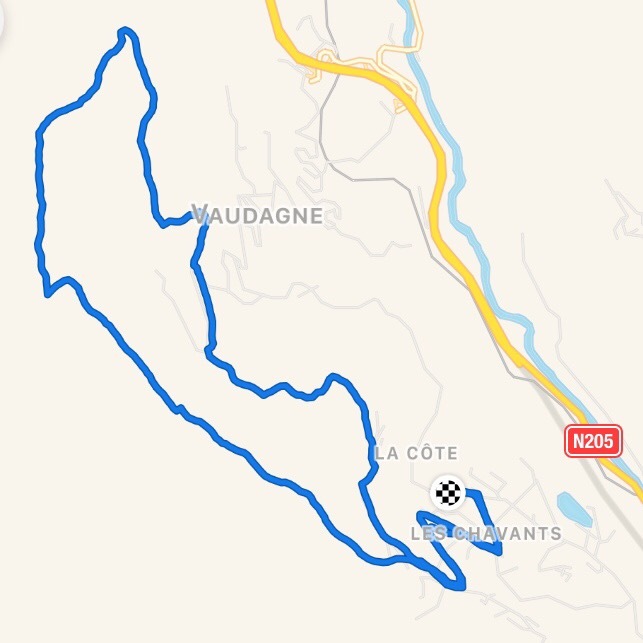 We jogged downhill into the centre of Les Houches, before crossing the main road and railway. Soon after this we were able to hit the trails. The uphill was gradual on soft terrain for a good few kilometres which meant we made good time on the ascent. We headed up to Le Flatiere, then turned off right (more uphill) before reaching it. The trail then took an undulating route round the mountainside until reaching Lac Noir. At one point we realised we were being followed by a runner behind us with trekking poles who was rapidly gaining. Out of breath, we were soon left behind as he disappeared ahead. We caught up with him later though, he was definitely looking lost! There was some really beautiful running along single file tracks through steep forests. The descent was too steep and slippery to run in places but these sections were quickly left behind and we found ourselves on wide rolling paths along the river. 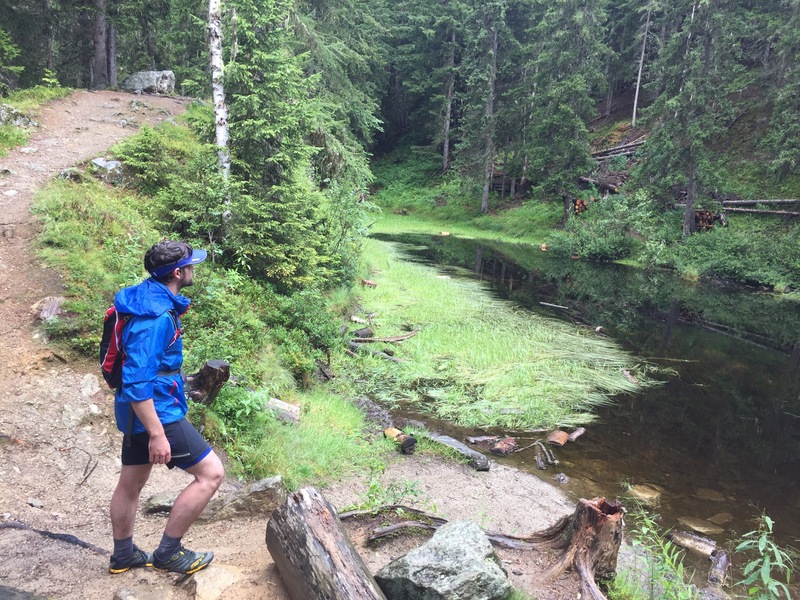 Chamonix was a fantastic place for running, beautiful trails and amazing scenery. It was inspiring to run with the mountains all around. The ski lifts made all the trails accessible without having to do too many metres of climbing so there are routes for all abilities. We can’t imagine how difficult the Mont Blanc ultra marathon would be, 103 miles and 9600m elevation. We got only the slightest taste this holiday – but it would be really awesome to complete such a challenging event some time in the future!